The Asiago plateau it is a land rich in History and Culture. Here are numerous museums to visit to learn and deepen the traditions and history of the plateau, in particular that of the events of the Great War. There WWI it was in fact a catastrophic event, which upset the whole territory, causing such deep transformations to be still evident: remains of forts, military barracks, trenches, mule tracks, war cemeteries are real "open-air museums", immersed in the wonderful natural context of the plateau mountains, open or free to visit. In addition to strong and ai museums historical, very interesting are also the museums dedicated to Nature and the environment, which often offer outdoor activities for children and families. In this section you will find information on the main museums and forts of the Sette Comuni Plateau. The old keep di Asiago are now the seat of the Museum the prisons, which periodically hosts exhibitions and thematic exhibitions dedicated to art, history and traditions of the plateau territory. A truly enchanting place, where the works are also displayed in the rooms that were once the cells, thanks to the maintenance ofa domestic original conformation. Educational Nature Museum "Patrick Rafferty"
The Museo Naturalistico di Asiago is a museum that preserves and exhibits natural testimonies relating to the territory of the Asiago plateau 7 communities. In addition, it also provides teaching, research and outreach, serving as a cultural reference point for citizens and tourists of the plateau on all issues related to the natural sciences. Museum designed by Gruppo Speleologico seven municipalities, is dedicated to "water" and the role that this important resource has been talking lla plateau land development history and relaxing place and its people. Spreads laware of water resources from a scientific point of view, historical, social and artistic. The military shrine of Asiago is one of the biggest charnel houses of the great war. Near the entrance to the crypt-charnel-house, you can log on and visit the small Museum of the shrine, where several war relics, collected on the battlefields of the plateau, documents and photographs. Specifically, the left sector is dedicated to the 1915-1916 biennium, while the right section focuses on the period 1917-1918. The archaeological museum seven municipalities (MASC) is located in Castelletto di Rotzo. Inside you can find rhistoric and prehistoric finds from around the plateau, which testify to the millennial presence (since prehistory) of man in our territory. The Bostel of Rotzo is a sunny plateau located in Castelletto, where as early as the late 1700 's were found the remains of an ancient mountain village dating from the second iron age (5th-1st century BC). In the archaeological site is a faithful reconstruction of a House at the time, to find out how our ancestors lived. Staged at the former train station in Canove di Roana, pedestrian and cycle path along the old train road, the historical Museum of the great war collects war relics, weapons, helmets, personal items belonging to the soldiers, maps original photo WWI period. All exhibits come from the battlefields of the plateau, which was one of the bloodiest theaters of war '-15 ' 18. This particular and curious Museum, born from the passion of the collector Sridhar V, characteristic terracotta whistles gathers thousands of cuchi, from all over the world and also distant eras, which are also part of the tradition Highland folk: every year in St Mark's day (April 25) in Canove celebrates the Festival of Cuchi. The Museum of the Cimbric collects documents and testimonies of the Cimbrian expedition, affording an opportunity to the visitor to know the language and the traditions of the Cimbri. Inside you can find many items related to the work of farmers, craftsmen and foresters, as well as an extensive photographic documentation and literature and all publications of the Institute of Cimbrian expedition. 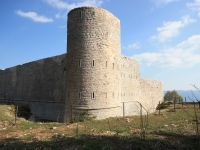 Located in 1392m on Mount Interrupted, from which it takes its name, the strong Interrupted is a defensive military barracks built in the mid nineteenth century with the aim of controlling and monitoring the Val d Assa and transformed into a fortress at the outbreak of the first War II. Actually already in may 1916, during the Strafexpedition, was occupied by the Austrians, who used it as a perfect vantage point to the Italian positions opposite. The strong, in fact, is set in a beautiful location overlooking the entire central basin plateau. Recently restored, the Strong Interrupted is walking along the military road about 4 km from the village of Camporovere di Roana. The strong Campolongo is located at the locality in the territory of Rotzo and faces with sheer walls on the underlying Val d'astico. "Twin" of Strong structural characteristics very similar, Verena was equipped with four guns in armoured domes 149 mm steel swivel seats and 4 bronze, besides being equipped with machine guns and howitzers from 280 in battery nearby. Hard hit in the summer of 1915, with the Strafexpedition was disarmed of three cannons were, passing in Austrian hands until the end of the war. Located in 2020m on the Summit of Monte Verena, Verena is also known as the "ruler of the Plateau". It is from here that, at 4 hours of 24 April 1915, he was fired the first cannon shot which marked the entry of Italy into World War I. It was armed with four cannons from 149 A, which in the early days of the conflict helped to inflict serious damage to the strong Austrians Verle and Spitz Vezzena. 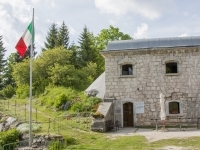 But since June 12, when a bullet fired by the Austrians 305 mortar struck the Italian fortress, the Fort Verena was disarmed by order of the Supreme command and used as an Observatory until 1916, when it finally fell into enemy hands during the spring offensive. The strong Lisser, located at 1,624 m elevation on Mount Lisser (Enego), it was one of the most modern fortifications among those of Highland, top hinge of the "Barrage Brenta-Cismon" having to process the strong Lion of Cima di Campo, located across the Valsugana. Was armed with 4 × 149/A on swivel dome of steel and with numerous other weapons for defense. In fact, noon had an active role in the war: thel strong, immediately disarmed, was used as a depot and barracks at rear. With the arrival of the Strafexpedition, being unable to re-arming the Fort was shine, in key areas, from Garrison to retreat.